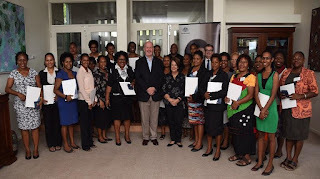 The Australian Governor-General, Sir Peter Cosgrove met with young Papua New Guinea entrepreneurs at an Australia Awards event hosted by the High Commissioner Bruce Davis, at his residence in Port Moresby. The entrepreneurs will be undertaking a Certificate IV in Entrepreneurship and New Venture Creation delivered by the University of the Sunshine Coast and LookNow Training in May and June, this year, through the Australia Awards program. The entrepreneurs shared plans for their businesses in agriculture, hospitality and tourism with the Governor-General. Over six weeks, they will develop skills and knowledge that will diversify their businesses when they return to Papua New Guinea. The entrepreneurs will also receive on the job mentoring in Papua New Guinea after their studies. 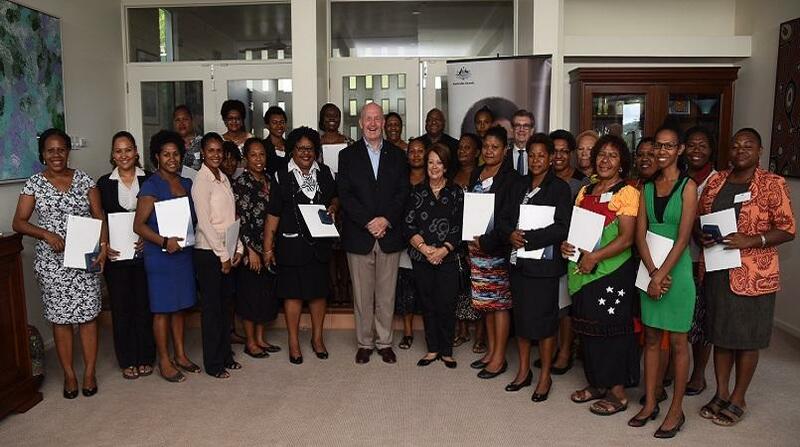 Each year, up to 200 Papua New Guineans undertake short courses in Australia under the Australia Awards Papua New Guinea Fellowship program. Of this group of entrepreneurs, 24 of the 25 are women with one male participant representing the Papua New Guinea Government. Australia Awards are a partnership between Australia and Papua New Guinea governments to increase the number of skilled graduates in Papua New Guinea and promote links and understanding between Australians and Papua New Guineans.